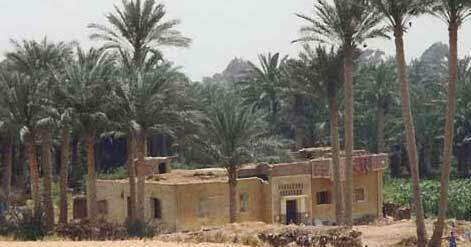 Mud-brick is still used as a building material for houses in Egypt and is made in the same way as in antiquity. Chopped straw is mixed with Nile mud and the bricks shaped in a wooden mould. They are then left to dry in the sun. The population of ancient Egypt was divided between a number of towns which grew up at regular intervals along the Nile and innumerable small villages which clustered around the facilities offered by there urban cent-res. Most important were the royal cities, chosen by the Pharaohs as their chief sears and cent res of the nation's government. Throughout the course of Egyptian history a number of places held this honour, such as Memphis, Thebes, Itjtawy, El-Amarna, Pi-Ramses and later Tanis, Bubastis, Sais , Next in Importance were the nine capitals, which acted as cent-res for local administration and taxation as well as housing the temples of the major regional deities, Then there were towns of some importance which lacked the political statues of nome capitals, such as Abydos, famous as a cent-re of pilgrimage to the shrine of the god Osiris . Many towns and villages had a long history of occupation, indeed a good number of ancient sites are inhabited to this day. One of the reasons for this long-term habitation of certain locations was the annual rise of the Nile which, until the 1960s, inundated the whole Vally of Egypt. To escape the waters, dwellings had to be built either in the desert margins or on the limited amount of elevated ground within the areas of cultivation. Also, the means by which ancient Egyptian building were constructed meant that over the centuries the height of the inhabited mounds grew, making them even safer from the flood. For everything, fro palaces and administrative buildings to ancient Egyptian houses and, until the New Kingdom, even temples, were constructed of unbaked mud-brick. Even in the dry Egyptian climate such a fragile material is fairly short-lived, and as the structures decayed, the inhabitants merely demolished them and built on the remains and on the not cleared heaps of rubbish that surrounded them. AS time passed , villages and towns rose above the surrounding countryside, forming quite considerable hills, now called tells. This phenomenon is common throughout the Near East. Unfortunately, there occupation has ceased by peasant farmers, who find the decayed mud-brick an excellent fertilize. This has reduced the quantity of ancient dwelling sites available for excavation, and the number is even further reduced because , as has already been mentioned , many ancient towns and villages are still under occupation. Nevertheless, there is still a substantial amount of archaeological evidence available, which supplies ground plans of ancient ancient Egyptian houses and some idea of their decoration and setting. To these bare bones can be added information from artistic and documentary sources as well as objects found in tombs, which help us to visualize a complete dwelling. The majority of Egyptian towns and villages seem to have developed in a piecemeal, haphazard fashion around a central core of public buildings. Town planning did exist, but, as we shall see, it was limited to specialized types of community created for specific, official purposes. There is also evidence of planning in the central government and palace quarters of the major cities, notably El-Amarna, which has been extensively excavated. The organic growth of residential areas in large towns and small village can be illustrated both archaeologically and from documentary papyri. A village of the late new Kingdom has been excavated within the walls of the mortuary temple of Ramses III at Medinet Habu. It consists of modest homes, which, according to the excavators, were laid out arbitrarily and without planning. Separating the houses are narrow alleyways which wander crookedly up downhill, with steps to negotiate the rubbish heaps on which the village is party built. Group of ancient Egyptian houses are constructed around central courts or blind alleyways, some of which are closed off from the street by gateways. It is evident that houses within these small complexes gradually altered and grew to meet the needs of succeeding generations of occupations. Occupation of housing by extended family groups can also be demonstrated by documentary papyri from several periods of Egyptian history. For instance, the household of Hekanakhte , a mortuary priest of the Twelfth Dynasty from the village of Nebeseyet neat Thebes , consisted of his mother , his concubine , a female dependent relative , five men who may have been his sons' three women probably his daughters , the agent of the estate and his daughters, the agent of the estate and his family , and finally a number of servants. Approximately seventeen centuries later, the development of a single property by a large family can be fallowed in a group of legal documents from Thebes. In 343 BC the owner of the house, Djufachi, a carpenter, divided it between five members of his family. Over the next forty years ownership of the divided property passed to other member of the family and to others connected to it by marriage. Eventually, through foreclosure and sale, the properties moved outside the extended family group, but by then the form of the original house had altered and grown into an organic series of dwellings.